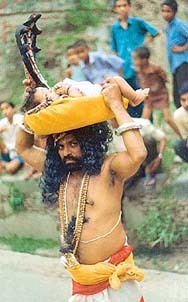 Performer seen as Vasudeva carrying the baby Krishna. Malda, Bengal. IT was in 1989 – or was it 1990? – that Buddhadeb Dasgupta made a wonderful little film called Bagh Bahadur. It was the story of a small man, Gunuram, a quarry worker, who would return to his native village in Bengal, year after year, to participate in an annual festival, dressed up as a "Tiger Man". I do not recall everything in vivid detail but, his entire body painted in yellow and black, complete with stripes and a tail, Gunuram would move from lane to lane, and shop to shop, with lithe, feline movements, posing as a bagh, thus affording simple entertainment to the villagers while collecting small amounts of money in the process. He had turned into a celebrity of sorts, and everyone, especially children, waited for the Bagh Bahadur to appear in the village. But this was not to last forever, for the times were changing and other means of entertainment were coming in. Including, one year, a circus in which a real tiger was featured. Gunuram’s clientele or audience started slowly to wane, the villagers, including the daughter of the village drummer, whom he had hoped to marry, drawn by the novelty and the glamour of this new source of entertainment. I do not remember the end – there was something about Gunuram challenging the real tiger of the circus to a duel – but I do recall the overpowering sense of sadness in the film, the depressing feeling of an era coming to a close. The film came to my mind rather naturally when I started looking up, the other day, the report of a research and documentation project that had been commissioned by the Crafts Museum in Delhi. The focus of the project was narrow, for it concentrated upon folk performances in one corner of a district in Bengal – Manikchok in Malda – consisting, essentially, of two forms: Domni and Mukha Naach. The study of the latter, involving the use of masks, was fascinating, for in it came together ritual, shamanism, impersonation, performance, even some form of social engineering. In the course of a local festival, on one day a person from a community held in truly low esteem – doms, telis, handis and the like – is chosen to act like a deity for the day in question, putting on a mask and carrying other appurtenances, thus ‘becoming’ Kali or Shiva or the like, dancing to the beat of the drum, and then seating himself on a platform to receive worship from everyone, including Brahmins, and to answer their questions as one who is in direct communion with unseen powers. A great deal goes on during the festival: celebrations, dancing, community singing and praying. But much attention remains focussed upon the masks, which come to acquire a power of their own, even when not worn. In fact, all kinds of masks are brought in by the folk as offerings, made sometimes by themselves, at others by professional craftsmen like carpenters, and kept in a place called the thaan, which takes on a sacred status through their very presence. Masks are to be seen everywhere during those days, not only inside the thaan, but even outside, sometimes suspended from the branches of the trees around the place. It is a remarkably colourful sight. For strict rules are observed: even when not in use, the masks receive daily worship; the person chosen to wear a mask on the designated day has to go through long days of self-purification and austerity earlier; prayers are offered to the mask before it is worn. For the belief is that the mask is a deity in itself. And chosen devotees, performers, in other words, are only ‘lending’ their body to it, enabling it to move and sit and dance. Because of this, the body becomes an appendage to the divine, and thus needs the rigour of purification. So on it goes, in this little corner of India. It is curious how all this gets linked to the general picture in which masks, all over the world and across the ages, need to be seen as significant cultural artifacts. Somehow, whether they belong to Egyptian mummies or medieval knights, Siberian shamans or carnival revellers, there is something that binds them. Is it perhaps the human need to hide things more than reveal them, the desire to take on other identities, to transcend earthly limitations, to be renewed and to be protected? Magic, initiation rites, burials, the warding off of evil spirits, fertility rituals, are all a part of it. The more intently one looks at the world of masks, the more does one understand of what lies hidden behind them. But, to get back to Malda in Bengal, and to all that goes on in its festivals, rich in masks and make-up, based at once in working day reality and in the desire to transform it. Here, according to the research and documentation report I referred to earlier, one comes upon another phenomenon, or a different kind of celebration if one so likes: the Song, a word derived apparently from the better-known Swang. This consists of an annual parade, like a carnival, in which all kinds of people participate, wearing different make-ups and disguises, dressed as some character from history, a figure from mythology, and so on. And this leads to enactments along the way, like a man dressing up as Vasudeva and entering the waters of the local stream with a winnowing pan on his head in which rests the baby Krishna. A great story is recalled through this, but the performer is suddenly aware of the divine ‘load’ on his head, and the audience knows that it is having a darshan of their Kanha as he is taken across the ‘Yamuna’, towards safety. Those engaged in theatre would know this, but I did not, till I started looking at the history of masks. Apparently, some of the earliest masks were those that were used in Greek theatre. Their invention is attributed to Thespis of Attica, who wrote a play giving the story-teller the task of speaking in dialogue. To make it easier for the audience to tell what a character was speaking at a particular time, the narrator would use different masks to represent the various characters. And since these ‘plays’ were performed in natural amphitheatres on the hillside, to make the narrator’s voice travel over the whole area, the masks often had large funnel-shaped mouths, a little like megaphones. Incidentally, I also did not know that the word ‘hypocrite’ comes from Greek hypokrites, which means a stage actor; hence one who pretends to be what he is not.